The English Bulldog is a muscular and heavy dog with wrinkled face. 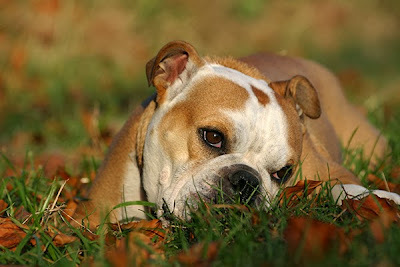 The average bulldog is patient, friendly, and gets along with children, other dogs, and other pets. Many bulldogs never venture out of their yard without their human, even if given the opportunity. They are calm dogs that like to lounge on the sofa and frown upon excessive exercise. They need regular walks, but they're not explosive packages of energy. It is important to know that bulldogs are very sensitive to heat and must be protected against heat stroke. They are also unable to swim. Owners with pools should take measures to protect the dog from falling in, and owners who consider taking their bulldog on a boat should invest in a good life vest. Bulldogs require little grooming. They are gentle, protective, and often form strong bonds with children.